Right-handed reliever Ken Tatum was off to a brilliant start in his baseball career, a candidate for American League Rookie of the Year honors with the California Angels in 1969. The award had never gone to a relief pitcher, but Tatum’s stats (7-2, with a 1.36 earned run average) helped give him a Wins Above Replacement (WAR) rating of 4.8. The winner was position player Lou Piniella, with a WAR of 2.1. Interestingly, another pitcher — Mike Nagy of the Boston Red Sox — had been second, with 3.0 thanks to his 12-2 (3.11 ERA) record. Tatum finished fourth. As the Angels’ P.R. staff enthused over his performance in a late September press release, they used a phrase that, seen retrospectively, seems almost eerie. Tatum was said to have been “fracturing records as the bullpen ace of the California Angels.”1 As events transpired, one of Tatum’s pitches the following year struck Baltimore’s Paul Blair in the cheekbone and in the long run may have held back Tatum from pitching inside as effectively as he previously had. The year after that, he himself suffered a broken cheekbone in a freak accident during a pregame practice. Kenneth Ray Tatum was born in Alexandria, Louisiana, on April 25, 1944. His father Ray was in the Army at the time. “I guess that’s where my dad was stationed,” Ken Tatum said in a July 2018 interview. “My dad’s name was just Ray Tatum. He didn’t have a middle initial or anything. My mother was from Hickory, Mississippi. One day they told me the story that the train was going through Hickory and my dad threw a letter off the train to where my mother lived. The railroad track was right behind the house. That’s how he corresponded with her a few times. I thought that was real unique. “My real mother passed away when I was 2 years old. I’ve gone back to visit my mom’s grave a few times; she’s buried in Hickory. I was raised by my grandparents. I called my dad ‘Ray’ and I called my grandparents ‘Mom’ and ‘Dad.’” My grandparents lived in Birmingham, so I guess that’s where I was raised. They had five or six uncles and aunts where they lived and they more or less took care of me. That was just when I was younger. Like in the third grade, I was still in my grandparents’ — until my dad remarried. When he married, we moved to a place called Midfield, outside of Birmingham.”2 Ray Tatum worked as an accountant for a trucking firm. After Ray remarried, Ken was joined by two half-brothers. Ken attended Midfield Elementary School, 15-20 miles southwest of Birmingham, then Jones Valley High School in Birmingham, where he played both baseball and basketball. Tatum grew to become 6-foot-2 and was listed during his major-league career at 205 pounds. He had kept busy throughout his youth and played Little League baseball, Pony League, Colt League, and American Legion ball. The Angels sent him to Davenport, Iowa, to pitch for the Single-A Midwest League’s Quad City Angels. In 30 innings over nine games, he was 1-2 (3.30). Tatum’s first full season of professional baseball was in 1967, pitching 157 innings for the San Jose Bees in the Single-A California League. In 21 starts, he posted a record of 12-6 with a league-leading 2.12 ERA, 141 strikeouts and only 48 bases on balls. He had a 1.000 fielding percentage, handling 40 chances without an error. Promoted to Double A in 1968, Tatum pitched for the El Paso Sun Kings (Texas League). El Paso won the pennant. Tatum was 11-7 (3.41), and in 1969 was promoted once more, this time to the Triple-A Pacific Coast League. Over the winter, he pitched in Puerto Rico. 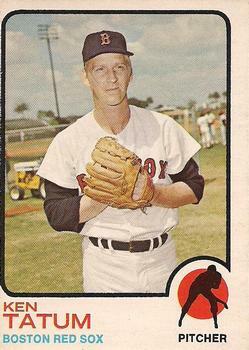 Tatum started the 1969 season, going 3-0 for the Hawaii Islanders, though with a 4.50 ERA. The Angels called him up in May and his major-league debut came on May 28, 1969. The Angels converted him to a reliever and over his six seasons in the big leagues, Tatum only started twice. The Angels had gotten off to an 11-28 start under manager Bill Rigney and after the May 25 game, Rigney was replaced by Lefty Phillips. Pitcher Rick Clark was optioned to Hawaii and Tatum brought up. It was Phillips who beckoned Tatum in from the Anaheim Stadium bullpen during the Wednesday night May 28 game against the Cleveland Indians. After the top of the sixth, Cleveland held a 4-0 lead and a pinch-hitter was put in for starter Tom Murphy. Bill Voss singled, another single followed, Jim Fregosi drove in one run, and Bubba Morton drove in two. The score was 4-3 and the Angels were back in the game. Tatum was handed the ball and struck out the first two batters he faced, then induced a fly ball to left field. He was replaced by a pinch-hitter in the bottom of the seventh. The Angels ultimately tied the game in the eighth, and won it in the ninth. Tatum faced two batters on May 30 and three batters on May 31, retiring all five. He got the win on May 31. He pitched two innings on June 4, and was finally touched for his first hit, a single. He surrendered his first run in his fifth appearance, on May 8, then didn’t yield another run until his 19th appearance, on July 13. The Angels had been in last place when Phillips took over and Tatum had been called up. They finished third. Tatum had enjoyed two scoreless streaks of 24 (June 10-July 12) and 17 innings August 8-September 1). He had also been pretty good with the bat, hitting for a .286 average with a pair of solo home runs in 24 plate appearances. In spring training 1970, he downplayed mentions of him in the same breath as Hoyt Wilhelm and Ron Perranoski. “That is just a lot of baloney. I had one good year. Any player can have one good year…Look at my minor league record for three years before that…there’s nothing that would indicate that I would have the kind of year I had with the Angels.”9 Come back and see me in five years, he said. He worried that the strain on his arm would cause problems. Though he worked for the Angels doing public relations work in the offseason that one year, he planned the following year to begin work on a Master’s degree. His expressed hope at the time was to coach college baseball.10 “When I was with Boston, I went to Northeastern University. I got a Master’s there and then I started working on my Doctor degree. I got halfway through that and just quit.” Tatum’s Master’s was in secondary school administration. It was a degree he put to work after baseball. Tatum had married Rebecca Ann Wrenn in May 1964, and the couple soon had a young son. “We met in the fifth grade,” he said in 2018. “We’ve been married 54 years.” They later had one more son and a daughter. Tatum’s 1970 season picked up just where 1969 had left off. He was just as good, if not better through April and May, allowing just three runs in his first 20 games. He was 2-1 with eight saves and an ERA of exactly 1.00 at the end of May. If so, it wasn’t immediate. His 1.00 ERA at the end of May became 1.57 at the end of June, then 2.72 as July closed, and 3.30 at the end of August. Tatum had also suffered from an inner ear infection. He improved a bit by the end of the season, finishing at 2.94. He was 7-4 with 17 saves. He had worked in 62 games. It was still a good second season. The Angels may have sensed a problem that was perhaps more serious than evident. On October 11, just a week and a half after the season was over, they traded Ken Tatum to the Boston Red Sox. It was a “double Tatum/double Jarvis” trade, with the unrelated Jarvis Tatum and Doug Griffin joining Ken on his way to Boston. The Angels received Ray Jarvis, Jerry Moses, and slugger Tony Conigliaro, who had suffered his own serious injury in an August 1967 beaning. Tatum’s first game for the Red Sox did not go well. On April 8 in Cleveland, he came in to close the game, pitching the bottom of the ninth with Boston nursing a 2-1 lead that disappeared after a single, a hit-batsman, a successful sacrifice, another out, and a two-run game-winning single by Gomer Hodge. By the end of April, though, he had 11 appearances under his belt and, despite a record of 0-2, five saves and a 2.02 ERA. Over the course of the season, that ERA doubled to 4.19 and he had a 2-4 record with only nine saves. He was far from the bullpen savior that the Red Sox had hoped to acquire. The Red Sox gave him one start, on August 17, but he only lasted a third of an inning. He certainly was not the same pitcher he had been. He’d suffered a major setback on May 23, when he was struck by a “soft liner” during batting practice in Baltimore. He was walking off the field when the ball hit him, fracturing his cheekbone in three places. The freak injury cost him a full month.19 Though the surgery was successful, he suffered terrible headaches for weeks. In 1972, though struck in the ankle by another batted ball in spring training, Tatum got off to a good beginning, with a 2.20 ERA at the end of May. But a sciatic nerve condition in his left leg and lower back put him on the disabled list for almost all of June and deep into July. It was an unfortunate year for the Red Sox, too. A labor dispute had caused the schedule to start a little late. The agreement was that each team would play out what remained on its schedule when the season began. The Red Sox played 155 games and were 85-70, but that left them a half-game behind the Tigers, who also lost 70 games but had one more game on their schedule and won it, edging the Red Sox and costing them a trip to the postseason. Tatum’s record was 0-3 with a 3.07 ERA, and just four saves while working only 29 1/3 innings. Had he been healthier and saved one more game (and all else remained equal), the Red Sox would have won. If he had been frustrated with the Red Sox at the time, that feeling passed. He was among the Red Sox alumni invited to the 100th anniversary of Fenway Park in 2012. “I considered it an honor that they invited me. I really did. I appreciated them inviting me. For medical reasons, I couldn’t go. I’ve had colon cancer surgery. I’ve had open heart surgery. It was just a situation where I really couldn’t go. I’m OK now. Everything’s OK. I’m just a little bit slower. Tatum started 11 games for the Pawtucket Red Sox and relieved in 21. His ERA was the worst of his career at any level — 4.81, and his record was 8-12. He was called up to Boston in September and appeared in one game, working four innings and giving up four runs. On October 26, the Red Sox traded him and Reggie Smith to the St. Louis Cardinals for Bernie Carbo and Rick Wise. Tatum never pitched for the Cardinals, due to a tight muscle in his right forearm in spring training that consigned him to the disabled list, but he did have one more shot in the big leagues when the Chicago White Sox sent Luis Alvarado to St. Louis and acquired Tatum on April 27, 1974. He and Rebecca Ann had just had their third child, Kimberly Ann. He appeared in nine scattered games for the White Sox in May and June, with a final 10th game on July 1. Working with pitching coach Johnny Sain, he said -- clarifying that he did not mean to say anything against Sain, “Everybody that went there, he wanted to teach them how to throw the slider. I think I lost a little bit on my velocity. That may have contributed to what was going on.” His time in Chicago was his last work in the big leagues. He had a 4.79 ERA in 20 2/3 innings, with neither a win nor a loss. After baseball, Tatum says, “I was in school administration for 18 years. I was an assistant principal and a principal. In Shelby County, about 10 miles outside of Birmingham. That’s where I live now. I’ve been an administrator of a day care for 20-some years now. That’s where I still am. It’s local day care, privately owned. I like it. It keeps me active.” The day care center is in West End, Jefferson County, Alabama, and cares for about 100 children, age six weeks to 12 years. Ken and Rebecca’s son Kenneth Ray Tatum Jr. served in the United States Air Force and retired as a colonel. “He flew the F-117 stealth bomber and the B-1 bomber. He did pretty well. I think you could pull him up on the internet. My other son, Kevin, he’s a school administrator. My daughter Kimberly has been a housewife. I’ve got seven grandchildren.” And he’s got that photo of Fenway Park as the wallpaper on his phone. In addition to the sources noted in this biography, the author also accessed Tatum’s player file and player questionnaire from the National Baseball Hall of Fame, the Encyclopedia of Minor League Baseball, Retrosheet.org, and Baseball-Reference.com. Thanks to Rod Nelson of SABR’s Scouts Committee. 1 Undated press release from the California Angels found in Tatum’s Hall of Fame player file. The date was almost certainly September 24 or 25, 1969, based on its reference to citing his stats through September 23, and looking forward to the Angels beginning their final road trip on September 25. 2 Author interview with Ken Tatum on July 3, 2018. Unless otherwise indicated, all direct quotations attributed to Ken Tatum come from this interview. 3 Career summary produced for the 1970 season. Ken Tatum player file. 4 John Wiebusch, “Tatum Again Rides To Rescue; Angels Blank Chisox, 1-0,” Los Angeles Times, September 5, 1969: 11. 5 John Wiebusch, “No. 1 Relief Pitcher? ‘Tatum!’ Angels Say,” The Sporting News, October 11, 1969: 14. 7 Ross Newhan, “Tatum Sleeps A Lot — But Not on Hill,” The Sporting News, July 12, 1969: 19. 8 John Wiebusch, “Tatum Angels’ Bullpen King,” The Sporting News, November 15, 1969: 48. 9 John Wiebusch, “Tatum, Sailing on Cloud 9, Hopes Bubble Doesn’t Burst,” The Sporting News, April 11, 1970: 46. 11 “Blair, Orioles Must Wait to Learn If Injury Will Affect His Eyesight,” The Sporting News, June 13, 1970: 17. 12 Melvin Durslag, “Danger in Dusters,” The Sporting News, June 20, 1970: 10. 13 Neal Russo, “Tatum Aims to Put Reddish Tint on Bosox Faces,” The Sporting News, January 12, 1974: 31. 14 Larry Claflin, “Red Sox Give Up Power for Strength in Bullpen,” The Sporting News, October 24, 1970: 13. 15 Clif Keane, “Sox Ship Tony C to Angels in 6-player Deal,” Boston Globe, October 12, 1970: 78. 16 Kevin Walsh, “Fenway Wall Never Worried Ken Tatum,” Boston Globe, October 13, 1970: 25. 17 Clif Keane, “Tatum Fires Fastballs But Dreams of Sliders,” Boston Globe, January 24, 1971: 86. 19 Clif Keane, “Tatum’s Cheekbone Fractured,” Boston Globe, May 24, 1971: 19. 20 “Struggle for Tatum,” The Sporting News, August 11, 1973: 38. 21 Peter Gammons, “Gold Glove outfielder Paul Blair passes away at 69,” Gammons Daily, December 27, 2013. http://www.gammonsdaily.com/peter-gammons-gold-glove-outfielder-paul-blair-passes-away-at-69/ Accessed June 30, 2018. 24 “Tatum Lasts Route,” The Sporting News, May 3, 1975: 30.